Despite some mid-day rain, several thousand people were in attendance to enjoy dozens of environmental and educational booths, children’s activities, tours of Gumbo Limbo’s sea turtle rehabilitation center, and great food. The Center was awarded with a Proclamation from the City of Boca Raton celebrating Gumbo Limbo’s 30th Anniversary, officially designating February 28th as “Gumbo Limbo Nature Center Day”. Now partners, the National Save The Sea Turtle Foundation and the Florida Hawksbill Project welcomed hundreds of curious visitors to their shared display booth, where they were invited to learn more about the Foundation’s programs. Coloring books, copies of Outreach Magazine, and turtle stickers were favorite take-aways among the younger visitors, and many people were interested in learning more about how we can protect our resident in-water sea turtle populations. 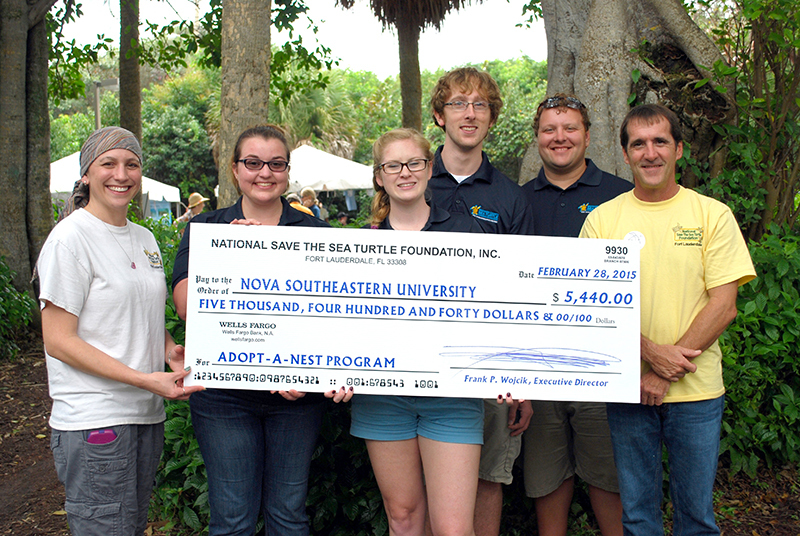 Later in the day, the National Save The Sea Turtle Foundation presented a check for $5,440 to Nova Southeastern University in support of the important sea turtle nest monitoring work they do in partnership with Broward County’s Sea Turtle Conservation Program. These funds were generated through the Foundation’s Adopt-A-Nest Program. You can help fund this important work by symbolically “adopting” a sea turtle nest www.savetheseaturtle.org.